Jones College guard Michael Williams Jr. (5) drives toward the goal against Meridian as JC forward Tirus Smith (4) braces to set a screen. 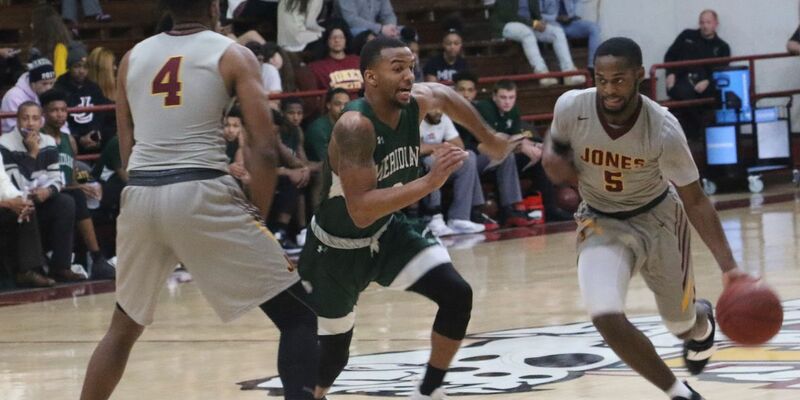 ELLISVILLE, MS _ Sophomore forward Galen Alexander scored 19 points and grabbed 12 rebounds to lead Jones College to its fifth consecutive victory with a 73-52 win over Meridian Community College at A.B. Howard Gymnasium. The Bobcats (13-4) improved to 7-1 in Mississippi Association of Community and Junior Colleges’ play, good for second place in the South Division. Sophomore guard Winceton Edwards added 16 points for the Bobcats and freshman guard LaDarius Anderson had 10. Meridian (9-8, 3-5) got 14 points from sophomore guard Kylan Hamilton and 12 from sophomore center Brandon Mills. The Bobcats will head to Utica at 7:30 p.m. Monday to take on Hinds Community College.